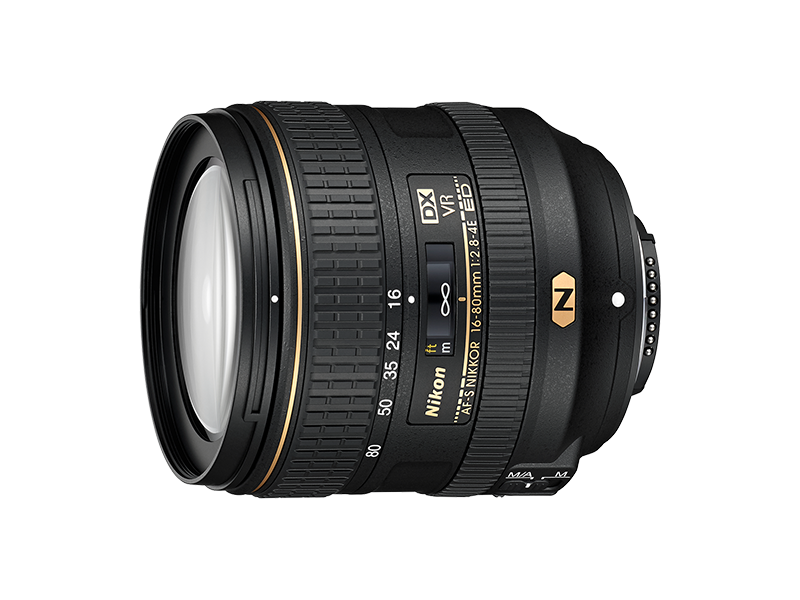 The world's lightest*, DX-format compatible, 16-80mm** f/2.8-4, 5x normal zoom lens featuring f/2.8 aperture at the maximum wide-angle position. * Among 5x normal zoom lenses with the f/2.8 maximum aperture at the maximum wide-angle position, compatible with lens-interchangeable digital SLR cameras employing APS-C-format image sensor, available as of July 2, 2015. Statement based on Nikon research. ** Angle of view is equivalent to that of a 24-120 mm lens in FX/35mm format. Vibration Reduction (VR) provides an effect equivalent to a shutter speed 4.0 stops* faster (NORMAL mode, based on CIPA Standard). * This value is achieved when the lens is attached to a DX-format digital SLR camera, with zoom set at the maximum telephoto position. Employs Nano Crystal Coat, aspherical lens and ED glass elements to achieve high optical performance with minimal ghost effect and chromatic aberration. Fluorine coat is applied to the extreme front and rear lens surfaces – a first for DX-format lenses.